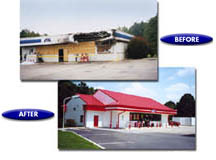 Lane Supply, Inc. is the right choice if you are changing brands to a new image or upgrading your existing image. 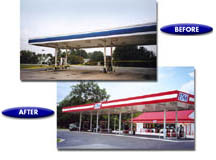 We consider ourselves to be the best in the industry when reimaging your existing canopy, convenience store or car wash. Lane reimages hundreds of sites per year across the country. Several major oil companies are introducing new images and contacting Lane will make sure the conversion process to be thorough and swift. We have the experience, quality and professionalism to ensure you receive the best professionally engineered and installed materials to meet your individual needs. If you have one, one hundred, or one thousand locations, Lane is the best choice for your reimage or upgrade requirements.